Buzz! Buzz! Do you hear that noise in your home? Has that buzzing noise become louder lately? Is it spring season in full swing? If yes, then it’s time to kick up your heels and take some action right away! Your home may possibly be infested by wasps. Wasps – Who are These Buzzing Home Invaders? Bald Faced Hornets are black colored 6 legged wasps, ¾ inches in size with large white patches on their faces. Their diet consists of fruit juices and nectar. Bald faced hornets are known to house their colonies in large hanging nests built on trees and occasionally in buildings. and fruits. And unlike other wasps, they hunt in groups. European hornets build their nests in hollow trees, barns, attics and house walls. And unlike their cousin wasps, they don’t prefer hanging nests. Yellow jackets have a strong resemblance with European hornets. However, what makes them distinct is that they have consistent yellow stripe patterns on their entire bodies, not only the tail in particular. 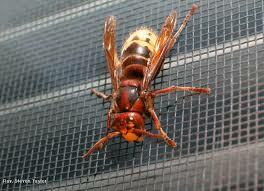 They are usually around 3/8 to 5/8 inches in size, comparatively smaller than the European hornets. These are carnivores and can sting badly. They mostly feed on caterpillars, insects and other garden pests. You can find them lurking around garbage cans too. Yellow jackets nest underground in rodent burrows and dark spaces. So, if you see a buzzing wasp making its way into a small hole in your home wall, then it’s probably the yellow jacket wasp. Paper wasp is the fourth commonly found specie of wasps. They are brownish in color with yellow and sometimes red markings. These are 5/8 inches in size. Their diet consists of caterpillars, flies and nectar. They prefer to live in small colonies. They build hanging nests on trees and porch ceilings, door frames, attic rafters and deck floor railings with paper and twigs. Generally, a single mated queen starts a new nest every spring. The queen lays eggs in a small nest that is usually made from loose tree barks and paper strips. The queen’s follower wasps then work to increase the size of the nest. The small nest turns into the size of a basketball by the end of summer. Season – wasps begin nesting from late spring to mid-summer. So, if you hear buzzing and spot a few wasps flying in your home during these seasons in particular, then this is definitely a sign of wasp infestation in progress. Buzzing Noise – Wasps make a loud buzzing noise. So, if you hear buzzing getting louder with time, be alert for wasp invasion. You may have uninvited guests hiding somewhere. Dead Insects- If you notice a lot of dead insects, this indicates that wasps are nearby and hunting in the surroundings. You must take measures to control and prevent wasp infestation immediately because they never stop by alone. They live in colonies which means you will be up against an army of wasps. Do Wasps Cause You Harm? Yes they definitely do! 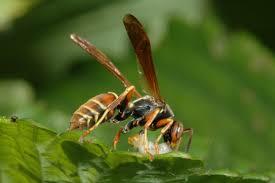 Though wasps are not aggressive species in nature but they can attack you if their space is invaded. Their sting also carries venom and may make you itch, swell and hurt for days. It may also lead to allergic reactions. Yellow jacket wasps house in holes and cracks therefore, make sure you fill up holes, cracks and gaps in and around your home. Wasps love to surround garbage bins. To prevent their infestation you definitely need to dispose of garbage immediately from your home. Also, always keep the bin covered tightly. There is always a possibility that the wasps may build their nests in your lawn. Therefore, it is advisable to maintain and mow you lawn regularly and get rid of weeds. You don’t want your lawn to be serving as a wasp harborage area. You can use wasp traps and organic plant based wasp repellents to trap and repel them. Though there are several chemical wasp repellents also available on the market, they usually pose serious health hazards. Therefore if you want to use chemical repellents, it is advisable to hire a professional for the job.